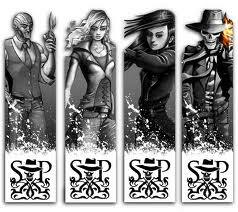 Skulduggery Bookmarks. . Wallpaper and background images in the Skulduggery Pleasant club. This Skulduggery Pleasant photo might contain cella di custodia, cella di detenzione, porta girevole, and revolver.